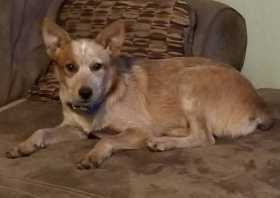 Lost Red Heeler - English Village/South Parkway (English Village Subdivision) - Huntsville, Alabama Have you seen Bailey? She went missing last night around 10:45 PM, on Leicester/Britain, in the English Village Subdivision. She is a Red Heeler and has a blue collar around her neck. Her owner is heartbroken and misses her terribly. Please see the attached photos and call if you find her.